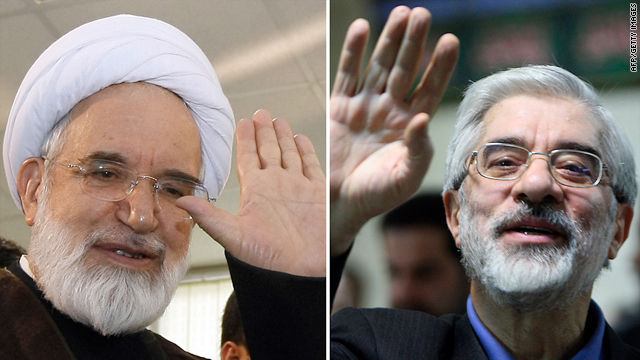 Opposition leaders Mir Hossein Mousavi, right, and Mehdi Karroubi, left, met to discuss the cases of 16 protesters who went on trial Saturday. (CNN) -- Two top Iranian opposition leaders have called on supporters to protest on February 11, the anniversary of the 1979 Islamic Revolution, an opposition Web site reported. According to The Green Way Web site, a meeting took place Saturday between opposition leaders Mehdi Karroubi and Mir Hossein Moussavi at Karroubi's home. They discussed the two executions that happened last week and the cases of 16 protesters who went on trial Saturday, the site reported. "The widespread arrests of political activists and university students, the silencing of the media, and the forced confessions of prisoners are against the principles of Islam and the constitution of Iran," the leaders said in a statement. Video: Iran hangs two men, but why? They also called for people to take to the streets on February 11 to demand their rights back as citizens of Iran, The Green Way reported. Meanwhile, state-run Press TV quoted Iranian President Mahmoud Ahmadinejad on Sunday as saying that the nation will deliver a harsh blow to "global arrogance" on February 11. Press TV offered no details on or explanation of the statement. Opposition protests were launched after the disputed June 12 presidential election that gave hardline Ahmadinejad a second term. The government denies accusations of fraud. About 4,000 people have been arrested in the post-election crackdown. As of January 24, the government had confirmed the deaths of at least 37 people in the protests or in detention, seven of those deaths happening on the religious holiday of Ashura. On Thursday, authorities hanged Mohammed Reza Ali Zamani, 37, and Arash Rahmanipour, 20, who had been convicted of being enemies of God and plotting to topple the Islamic regime. The two were convicted in mass trials of opposition supporters in August, but Rahmanipour's lawyer said the young man was arrested two months before the election.